Sharing 98.5% of the same DNA as humans, it is not surprising that bonobos possess very human-like qualities. They embody a profound intelligence and a deep emotional capacity. In fact, in captivity, bonobos have picked up on many facets of human culture, sometimes simply through observation of the researchers around them. They have learned how to communicate in human languages, use tools, play music, and in one case, a bonobo actually tried her hand at driving a golf cart (only to crash into a tree shortly after). Physically, they resemble chimpanzees, a close relative. In fact, bonobos are sometimes referred to as pygmy chimps because scientists first believed bonobos were a subspecies of chimpanzees. Further inspection revealed differences, and scientists later categorized them as their own unique species. With a more upright skeleton, long legs, and narrow shoulders, bonobos have the ability to walk bipedally, or on two legs, more easily and for longer amounts of time than chimpanzees. Their skeletal anatomy is actually very similar to Australopithecus , an early ancestor of humans. Their faces are flatter with a higher forehead than those of chimps, and their long black hair parts in the middle. When a female reaches sexual maturity, she will join another group. This limits inbreeding and increases genetic diversity among populations. When approaching a new group, the young female will seek out older, high-ranking females and attempt to form a bond through grooming and sexual behavior. Sexual behavior is predominant in bonobo life. They engage in sexual behavior for a variety of reasons: to form bonds, to neutralize tense situations, to express excitement, to greet one another, to encourage sharing and compassion, and of course, to produce young. Bonobos reproduce at the same rate as chimpanzees, giving birth every 5-6 years. A female will bear young for the first time around 13-14 years old. She will nurse and carry her offspring for up to 5 years. Males do not take part in the rearing process. 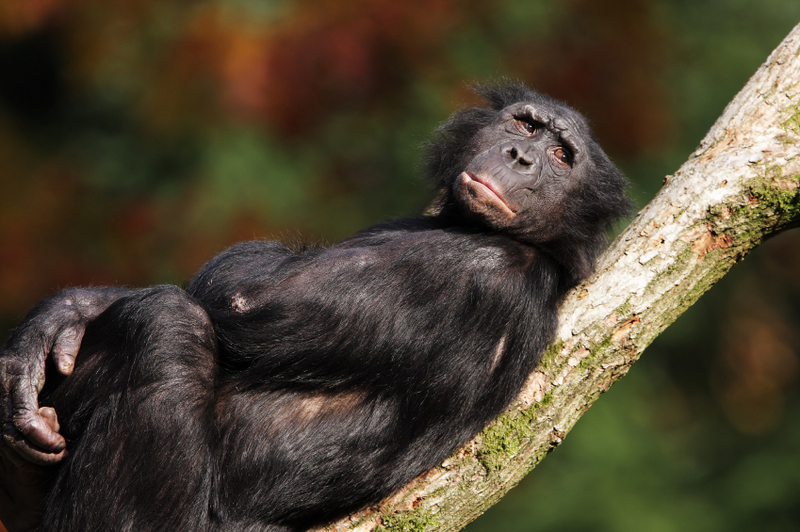 The bonobo’s diet is largely vegetarian. Foraging in small groups, bonobos feast primarily on fruit, but they also eat leaves, flowers, bark, stems, roots, insect larvae, worms, crustaceans, honey, eggs, and soil. Occasionally they hunt small mammals like flying squirrels or duikers (small antelopes). At night, bonobos gather with their groups to nest, communicating with each other with high-pitched barking sounds. 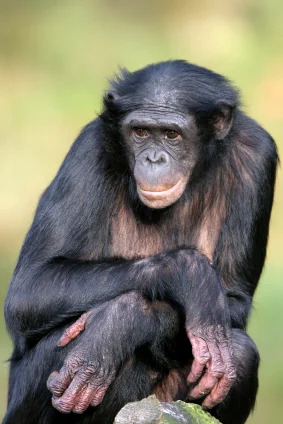 To help bonobos, you can volunteer with or donate to the Bonobo Conservation Initiative, which promotes the conservation of tropical forest habitat and the creation of natural corridors to connect isolated communities. 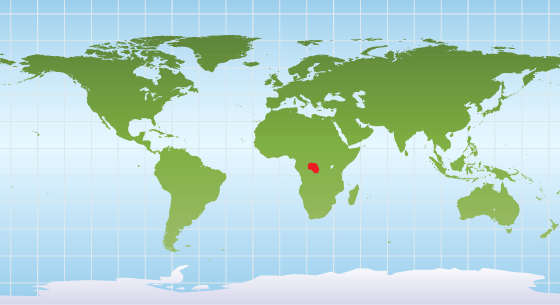 Bonobos inhabit the rainforests of the Democratic Republic of Congo in Africa.